HappyCabbie: Chris Hayes of MSNBC Did WHAT? Chris Hayes of MSNBC Did WHAT? I was going through my twitter feed last night when I stumbled upon some tweets about MSNBC having someone from the KKK on discussing the possible looting of Ferguson and the St Louis Area. At first I thought this was an exaggeration. Someone was simply over reacting to some white guy and accusing him of being from the Klan. Still I was curious. So I went to MSNBC and holy smurf they actually had someone from the KKK discussing racial tension in Ferguson. So for those who haven't seen it, here is the video. The tl;dr version of this interview is people are afraid of riots and looting and the KKK is telling people to arm themselves and be ready. The segment is then followed up by by the obligatory black person reacting to what the KKK is doing and why it's wrong. 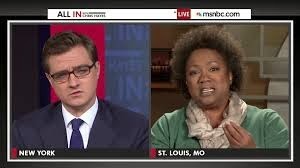 MSNBC brought on Lizz Brown to explain to us that racism is bad, you know for those who don't know that racism is bad. 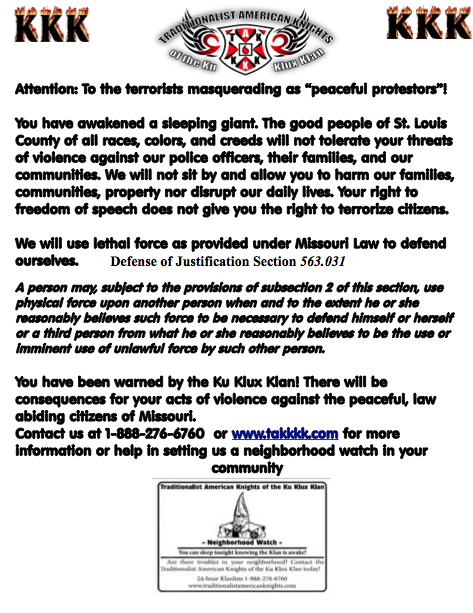 For those who haven't read it this is the text from the flyer that the KKK is passing out. Chris Hayes then uploaded a video to the MSNBC YouTube channel defending his decision. Dear Chris Hayes, just because someone says something or does something does not make it news worthy. I can find people who claim that Hilary Clinton is a reptilian. We got people who are trying to claim that monster energy drinks are satanic. You don't need to give air time to someone from the KKK and then claim you are doing it to educate the viewer that racist people exist. At least when Jerry Springer invites people from the Klan to be on his show he is honest about why he does it. Here is the segment MSNBC should have done. Go in depth about why gun sales in the St. Louis area are up. Why are people scared that the Ferguson/St. Louis area will erupt in riots if the grand jury does not go after the police officer who shot Michael Brown. Go into the history of race riots. Perhaps interview some of the store owners who took to the roof tops and defended themselves in the L.A. Riots. Having someone from the KKK on your show will do nothing but add fuel to the fire. All your segment did is further escalate racial tensions because now we got people worried about the KKK with guns. Or maybe we should just leave the KKK to Jerry Springer. If you wish to continue this discussion do so @happycabbie on twitter.